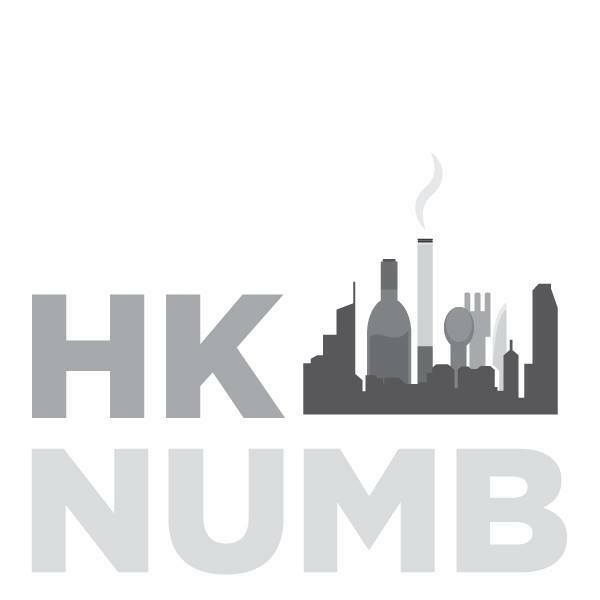 A slight detour from Knutsford Terrace and you find yourself around Kimberly Road and Austin Avenue, an area I can only describe as Hong Kong’s K-Town. Indeed, Tsim Sha Tsui is synonymous with some of the best Korean food in Hong Kong, among other things (read: that ma laa yue daan near Granville Road that Andrew and I are currently obsessed with), so for anyone thinking of getting their Korean hotpot or BBQ on, this is the sitch. 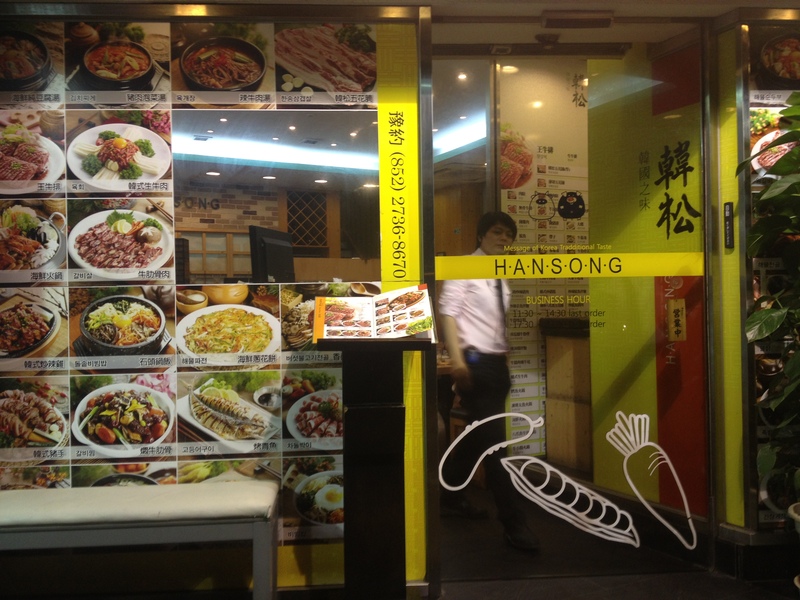 If you walk further to Austin Road (closer to Jordan station than TST), you will come across Hansong, a delicious go-to for some late night Korean BBQ. Which is just what we did on a Saturday night. Hansong doesn’t look like a huge space from the outside, but there’s a whole upper floor that has long communal dining tables with miniature gas stoves slapped down the center. The decor is quintessentially Korean with the light, clean, vertically-paneled wood (almost as if the room had been preserved from an 80’s cabin), and the smell of disinfectant mingled with delicious barbecued beef aromas was alluring as well as comforting. I was fairly amused by the overly-Asian First Aid boxes I saw hidden around the restaurant too, for all those dangerous diners getting too close to the grill, I suppose. I wasn’t swept away by their slogan. But I guess it gets the message across. They serve Korean food here at the Korean restaurant. 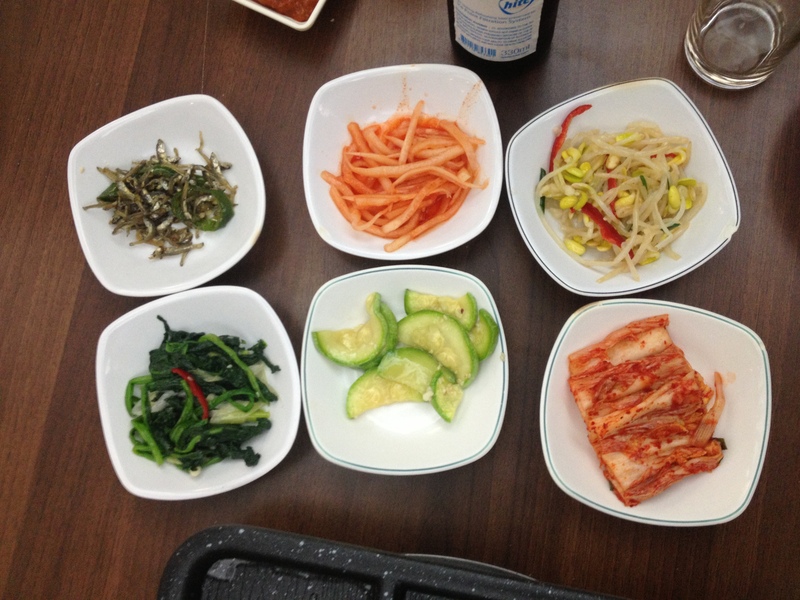 Always a fan of free goodies, I love banchan and everything here was a treat. Kimchi, namul (spinach, beansprouts, courgettes) and delectable itty bitty dried fish are served front and center before you order. 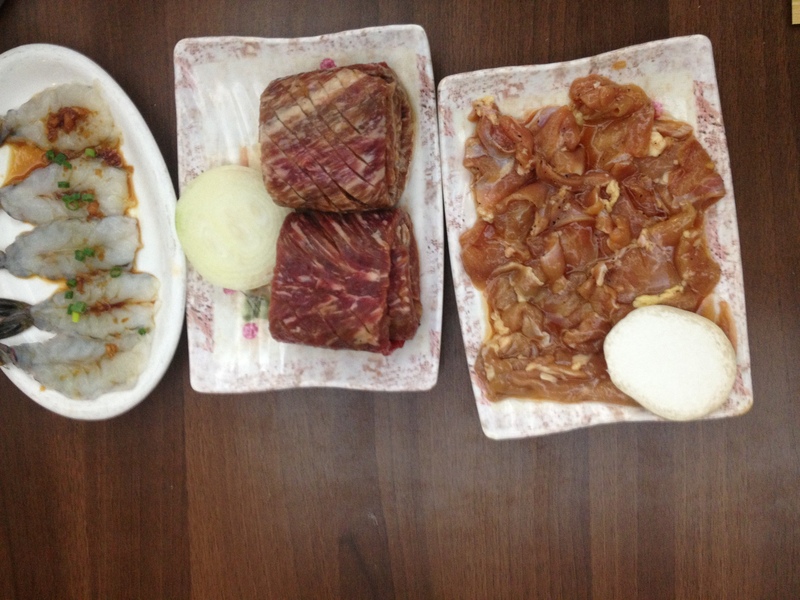 For gogigui, we ordered the galbi, or marinated short ribs ($270~), chicken and prawns. However, don’t be deterred if you’d like to get a hotpot fix too – they offer this as well, and I’m eager to return for a big pot of thick spicy stew. 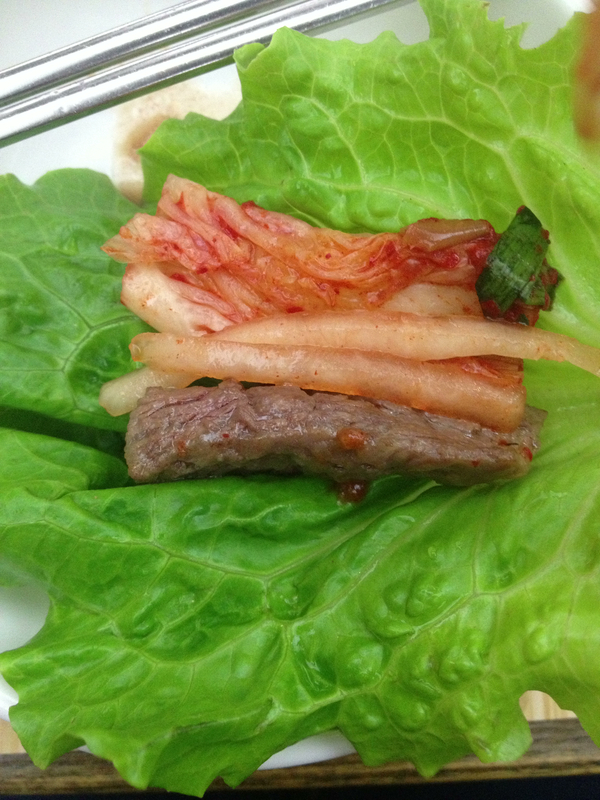 We also ordered a side of vegetables for $50- this is rather steep for a bunch of raw greens, but I couldn’t imagine the meal being as amazing without the crunch of the fresh green lettuce wrapped around the shortrib, the almost minty flavour of the beautiful Shiso leaf to counter the pickled kimchi and gochujang, and the bite of cucumber for a post-meal cooldown – that is, if your bottle of Hite hasn’t quite hit the spot. 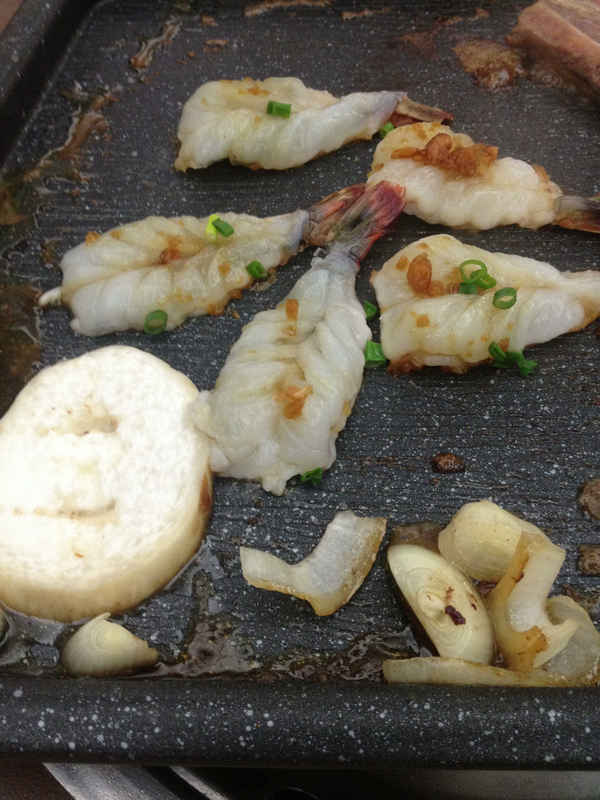 The shrimp was wonderfully fresh and sweet, and came with a surprising little star: the slice of mushroom (above) that soaked up all rest of the oils and marinade still left on the grill from the short rib, chicken and prawns. That’s right: all that garlic, soy sauce, garlic, beef juice, sticky icky delicious was soaked up by the mushroom sponge. A fully flavoured fungus wasting nothing on that grill. 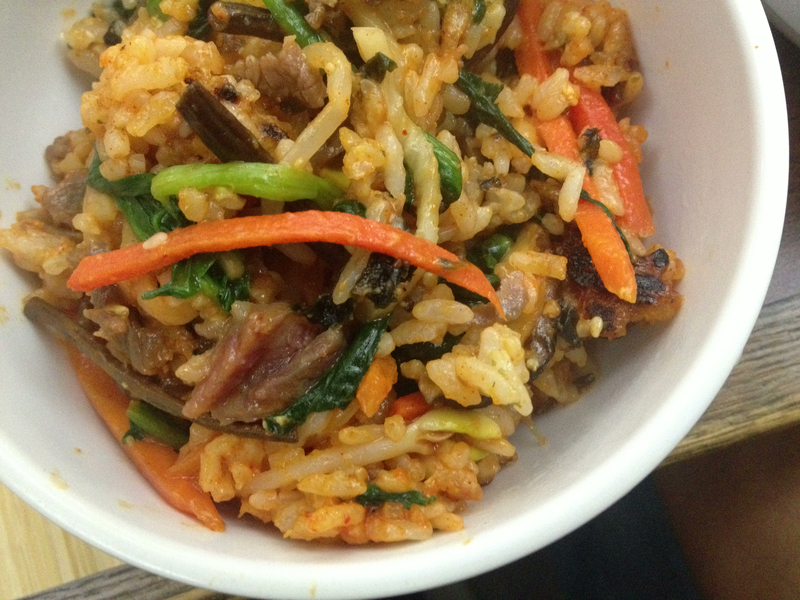 We were planning to order more dishes, but once the bibimbap made an appearance, we were satisfied. 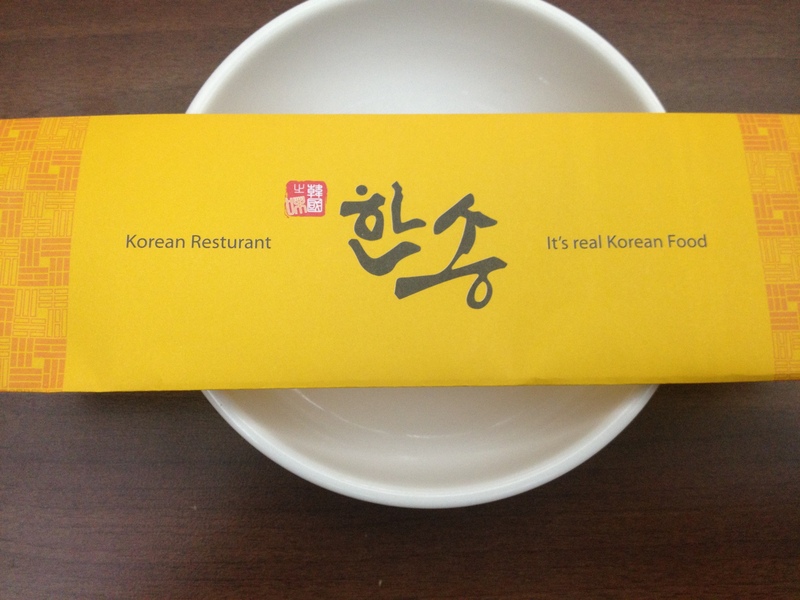 So I apologise for the very generic Korean dining experience. Good for two portions, the bibimbap came out in the stone pot, and was mixed on the table with gochujang and the raw egg. We ordered ours with slices of beef, but you can opt for chicken, pork, or without – and we absolutely relished all the textures of the namul – the julienne carrots, spinach, beansprouts etc – and the crunchy charred bits of rice that got stuck at the bottom. 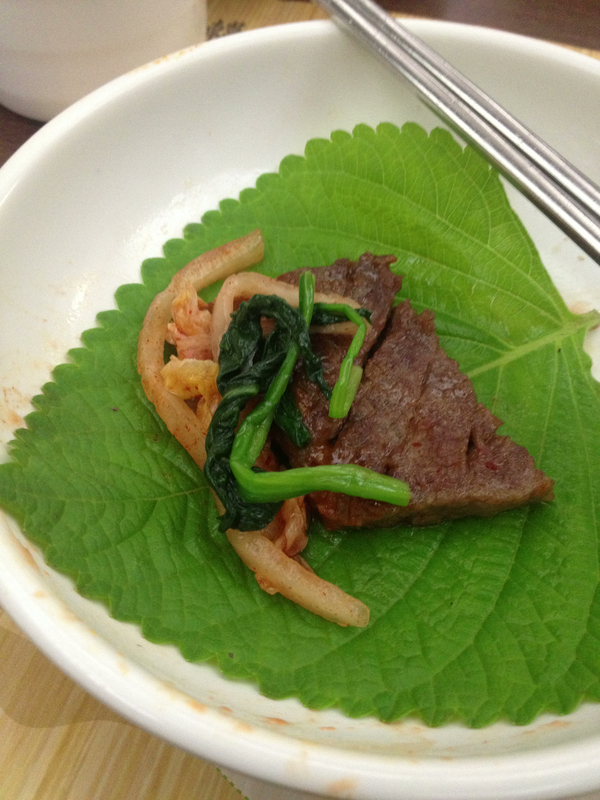 Most loved all of us was the gosari or bracken stems, commonly added to bibimbap, and which still had a slight crunch. A Part II on this will likely be coming soon as I can’t help myself salivating from that bowl of pearly rice goodness. my husband loves some of the korean dishes, not to mention korean bbq 🙂 must go!